Circus as we know it began in London, with entrepreneur Philip Astley’s invention of the equestrian ring in 1768. But as the form became a global craze, crossing oceans and touring cities and towns, other countries began to outstrip the UK when it came to exploring the artistic potential of its mix of skill and spectacle. Cirque du Soleil, which began in 1984 in Quebec, is now a worldwide phenomenon. Its evocative, highly skilled acts – far removed from the traditional clowns and animals – have been instrumental in changing people’s perceptions of circus. And countries such as Canada, France, Belgium and Australia have embedded the form educationally and pushed it in bold new directions. But what of the UK? Well, after a wilderness period for contemporary circus, we’re in a resurgence. Underbelly’s seventh Udderbelly Festival, with its circus-filled line-up, is in full swing on the South Bank; circus competition Circus Maximus is now in its third year there; and Underbelly will launch its new, purpose-built Circus Hub, comprising two 750-seat and 250-seat spaces, at this year’s Edinburgh Fringe. Circus Hub arose because Underbelly “felt there were some great shows that needed to come to the fringe, that would have a place there, but the environment wasn’t necessarily there technically or commercially,” reveals Ed Bartlam, Underbelly’s co-founder and co-director. The company is footing the financial risk for some productions and fully providing for circus’s backstage needs. In stressing the value of providing companies with the space to develop and show their work, Bartlam is quick to praise pioneering venues and companies like the Roundhouse and NoFit State Circus for also championing contemporary British acts. “It’s about making it a cool thing to do,” he says. Traditional touring circus still has a valuable role. But Bartlam sees contemporary circus’s ever-growing popularity as part of a general embracing (certainly by younger audiences) of forms such as immersive theatre, where physicality and narrative intertwine. And he believes that circus has ditched its more stubborn stereotypes, with people appreciating that, “while it’s one genre, in that genre there are so many variations”. A wave of young British artists who grew up watching the likes of Cirque du Soleil and other major international companies are now flexing their own creative muscles. Circumference’s first full-length piece, Shelter Me, has just opened at Theatre Delicatessen in the former Guardian newspaper building in London. It mixes acrobatics, installations and digital media, blurring the line between audience and performer. For Mulligan, circus is “the perfect friend” for the digital world that Shelter Me explores. “Sharing with an audience the trust and the intimacy that you create within circus is a really lovely counterpoint to the way that we communicate with each other through technology,” she says. This generation of British performers is using circus to comment on the world, fusing disciplines into striking new shapes. Often, they’re swapping spectacle for intimacy. 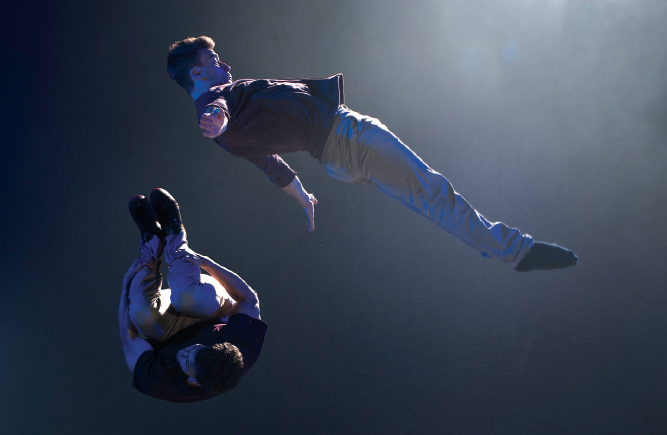 Bromance, an award-winning show by experimental acrobatics company Barely Methodical Troupe, tackles the physicality of modern-day male friendships. But developing an idea needs time and support. Winning the grand prize of £4,000 at the first Circus Maximus, with Bromance, has helped Barely Methodical Troupe to create new work, and Underbelly recently presented Bromance at the Adelaide Fringe. 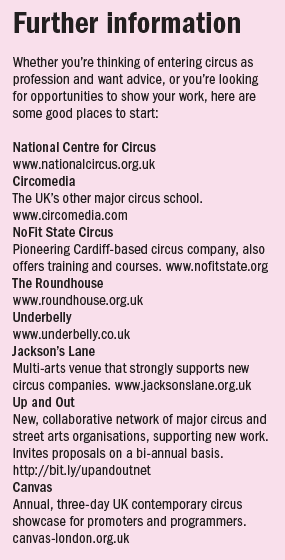 For Bartlam, these are examples of how organisations like Underbelly can help dynamic, new, British circus companies establish themselves. 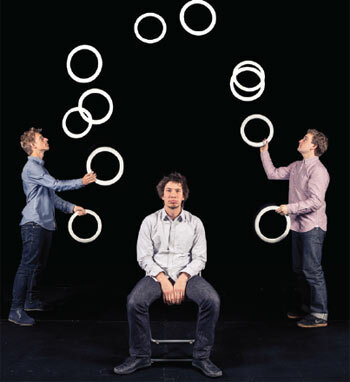 What links Barely Methodical Troupe, Circus Geeks and many others is that they all have members who have trained with the National Centre for Circus Arts (formerly Circus Space), which co-created Circus Maximus with Underbelly. Offering courses including a full-time degree programme, this Shoreditch-based institution has been committed to raising circus’s profile since its beginnings in the early 1990s. For joint chief executive Jane Rice-Bowen, the centre is about making people take notice of circus as a legitimate art form. Last year, when theatre tax relief was announced, it was omitted from the list of eligible shows in the consultation. “We were able to make the circus sector aware of this, come up with a response and start conversations with the decision-makers,” Rice-Bowen says. As a result, circus made the final cut. As part of this validation, Rice-Bowen would like to see as many school and community-based circus opportunities as there are in some other countries. Giving British circus artists the resources, funding access and business skills so they can realise their ideas in the UK rather than having to join international companies is central to the NCCA’s ethos. Rice-Bowen points to Bromance and Beta Testing as examples of this hoped-for future. “We’re trying to create opportunities for artists, directors and choreographers to work together, to find a new voice,” she says. Certainly, the demand for circus is only growing. Since 2007, when Leila Jones took on the specially created role of circus producer at the Roundhouse – then, the only such position in the UK – the venue has met and exceeded its long-term audience targets. In general, Jones believes that “venues are catching on that you bring in a much younger, more diverse audience if you programme circus”. As well as showcasing renowned international companies like Circolombia, the Roundhouse holds a two-yearly circus festival, commissions new projects, hosts residencies and sets up partnerships with other venues. This is all part of its long-standing mission statement to be at the forefront of circus. There’s still more to be done. Many people starting out in contemporary British circus would like to see a stronger touring circuit, beyond the big festivals. Some unhelpful stereotypes still linger. But things are changing. And the Udderbelly South Bank season is attracting people who might never set foot in a theatre. “It’s all quite social and informal, compared with the West End,” says Bartlam. Meanwhile, for Jones, the appeal of circus lies in the fact that it is “an anarchic art form… It’s not sensible or grown-up”. Right now, from the enduring thrill of traditional big top circus to its more contemporary branches, the future is looking bright for British circus in all its forms.